A very rare binary system discovered! One of the Nature’s Research Highlights pick from the scientific literature announces the discovery of a very rare binary system (Nature, Research Highlights, Vol 547, July 13, 2017). The system consisting of a brown dwarf and a white dwarf was being totally eclipsed every 71.2 minutes. 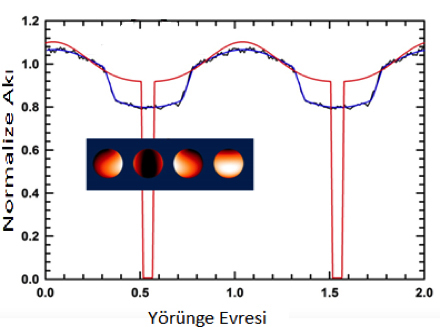 Astronomers from MIT, Harvard, Bishop University, Ege University, Montreal University, NASA and Dartmouth University have discovered a very rare binary star system, using NASA Kepler K2 space telescope and Earth based telescopes. Figure 1. 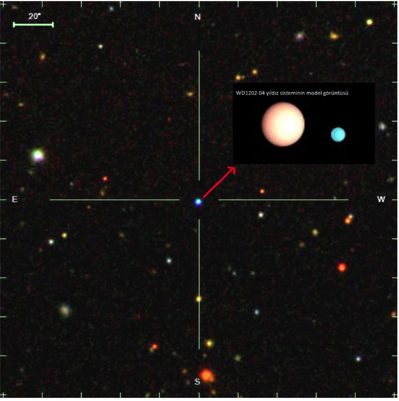 The point source at the centre is SDSS image of WD 1202-024 (see Fig. 2 of Rappaport et al. 2017). Binary model is shown on the upper right. The binary system contains a white dwarf, the remains of a Solar like star and a brown dwarf an object too light for a normal star. Researchers found that a white dwarf was being totally eclipsed every 71.2 minutes by the brown dwarf. Figure 2. K2 light curve of WD 1202-024 folded about a period 71.2-min. The red curve represents a geometrical model with a 5-min long eclipse and two out-of-eclipse cosine functions to emulate the illumination effect on the secondary star – with a ∼18 per cent peak-to-peak amplitude. The heavy blue curve is that model convolved with the K2 integration time of 29.4-min (Fig. 1 of Rappaport et al. 2017). In this study, it has been also investigated how these bodies could come to orbit each other at less than the distance between Earth and the Moon without transferring mass. The models suggest that the white dwarf’s predecessor probably expanded into a red giant, engulfing the brown dwarf that caused the less-massive component to spiral inwards, throwing out most of the matter from the giant and leaving it as a white dwarf. The authors predict that the white dwarf will creep close enough to start feeding off its companion in 250 million years and will show the characteristics of a cataclysmic variable (CV). WD1202-024 system, therefore can be referred to as the shortest period pre-CV that has been discovered to date.